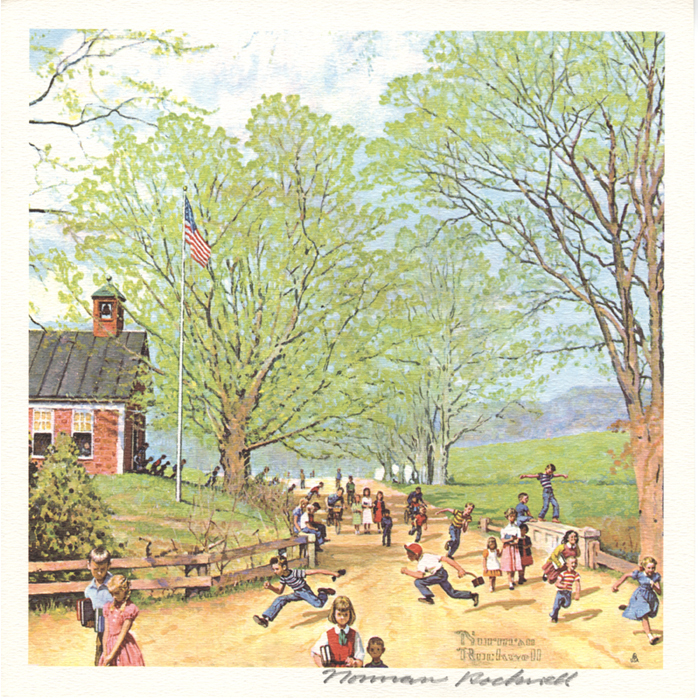 This limited edition offset color print entitled School’s Out measures 10 X 10 inches and is hand signed by Norman Rockwell in pencil at the bottom. Norman Rockwell was commissioned by Brown & Bigelow to produce numerous four season calendars. For the 1959 calendar Rockwell’s image School’s Out was used for the spring scene. Rockwell aimed to convey the essence of the season by a variety of poses and props to achieve specific moods. The purchase of any limited edition Norman Rockwell print is accompanied by an Authenticity Certificate signed by our Museum Director, a complimentary one-year Museum family membership, and care and handling instructions for the print. Payment plans are available. All limited edition print purchases contribute directly to the Norman Rockwell Museum to preserve and present the art and legacy of Norman Rockwell.